If you have a group of like minded friends or a family looking to complete an RYA Sailing Course why not sail together and receive a 5% per person discount? With up to 5 students on board each yacht we can tailor the course to your requirements, offering total flexibility and bespoke training as required. Your instructor will consider the needs of everyone and structure the course accordingly, keeping everyone happy. To take advantage of the group booking option simply elect a group leader and forward to us the contact details of all parties including course required. 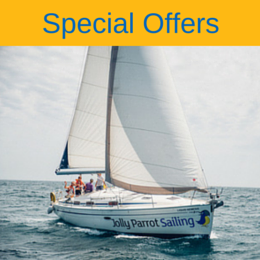 The Jolly Parrot team will then contact each member and take appropriate payment. Simple! Note: To qualify as a group there must be 4 or more members in the party.